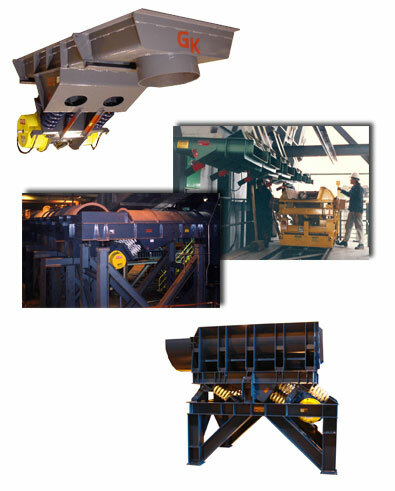 Vibrating feeders by manufacturers with over 50 years experience in the Bulk Processing industry. 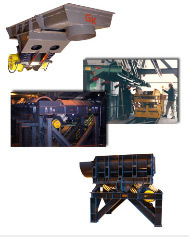 Feed rates are adjustable for all vibratory process equipment and systems. 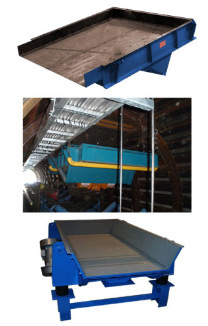 Selection of vibrating feeders will depend on the application, flow rate and material. This will be either a feeder with a natural frequency drive or a direct drive vibrating feeder. Custom installations usually include a fixed or variable force configuration. These use a sub-resonant, two-mass system. Mass A (the bulk material) moves Mass B (the feed deck) through engineered coil springs. Therefore, only small amounts of energy are needed to maintain the feeding energy stored in the coil springs. This can result in a higher feed capacity at lower energy rates because the variable force and springs do most of the work. Designed for continuous, rugged, heavy-duty operation. 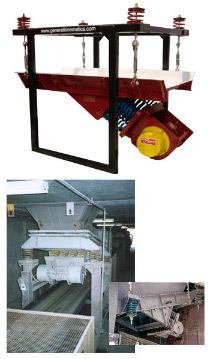 These types of feeders can be custom designed to feed the most difficult materials. Some common applications include: recycling, coal, scrap metals, industrial materials, minerals, chemical and more. Even after 40 years of continuous use, some of these vibrating feeders are still in use today.